Last year my family and I took a trip to Walt Disney World. You can read about that here. Since I have 2 little girls, most of that trip was about meeting all the princesses. We missed out on going on all the rides, so my husband and I went back this year without the kids. We eloped, so we never had an actual honeymoon. So this trip was it. Disney was amazing last year with our vegan diet and my daughter’s allergies. So this year I wanted to try all new places to see if we would have another positive experience. We totally did! The first day we got into the park mid day, so we did not do a sit down meal. Just a couple of quick service stops. For lunch, we went to Pecos Bills in Magic Kingdom. They serve Mexican food. They just recently added a vegan option to their menu. It is a roasted vegetable rice bowl. I ended up getting the fajitas without meat. It was basically black beans and veggies with fajita seasoning and also some cilantro lime rice. 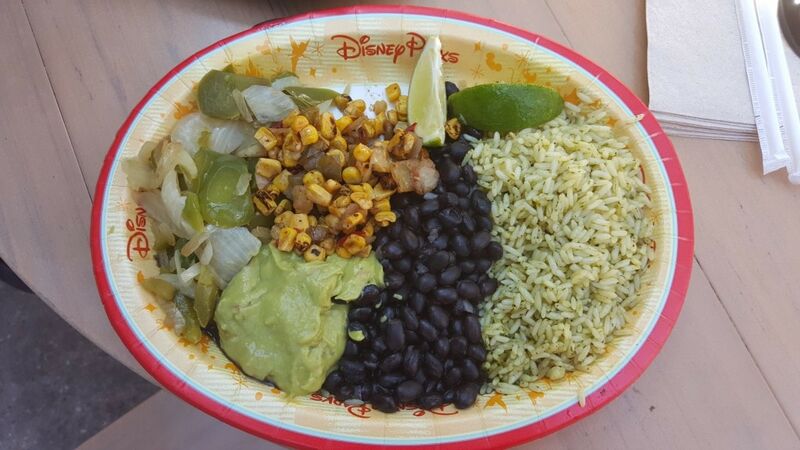 They also had a fixings bar where I was able to add roasted corn and guacamole. 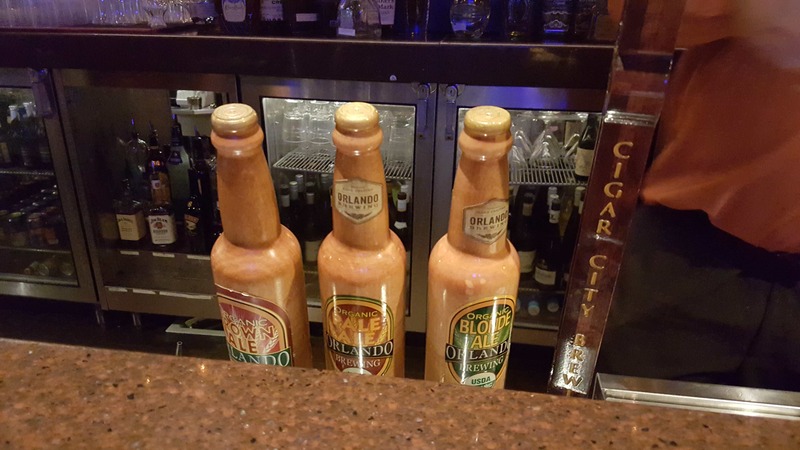 They also had salsa. The roasted corn was my favorite part. So yummy. Update: I was just told the cilantro lime rice contains dairy. Make sure you order the white rice if you want to avoid it. There was so much food, I couldn’t eat it all. Marcus ate what I could not. A few hours later, we decided to get some Dole Whip. You can’t go to Disney without trying Dole Whip. It’s the bomb and vegan. 🙂 It was so big, we decided to split it. 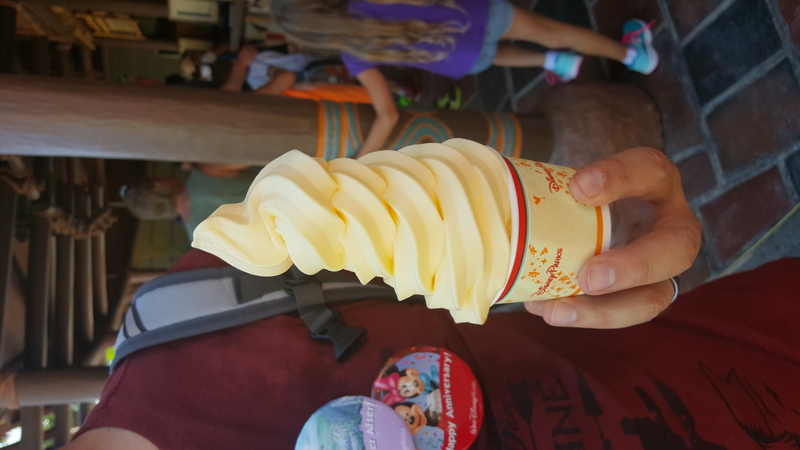 You can find Dole Whip at Aloha Isle in Magic Kingdom. 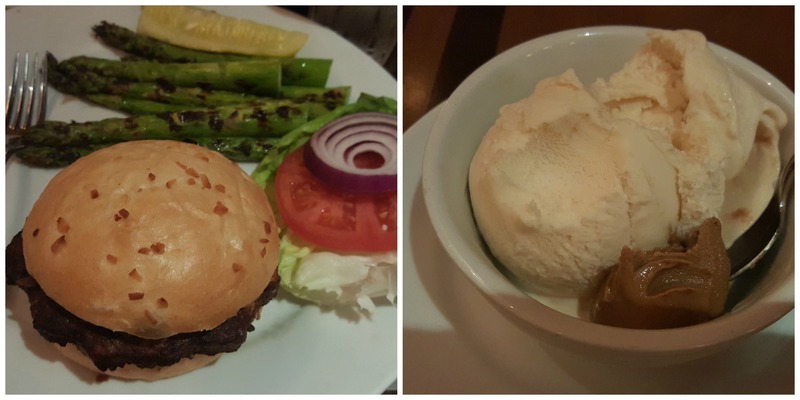 The next day, we decided to check out Erin McKennas in Disney Springs (formally Downtown Disney). 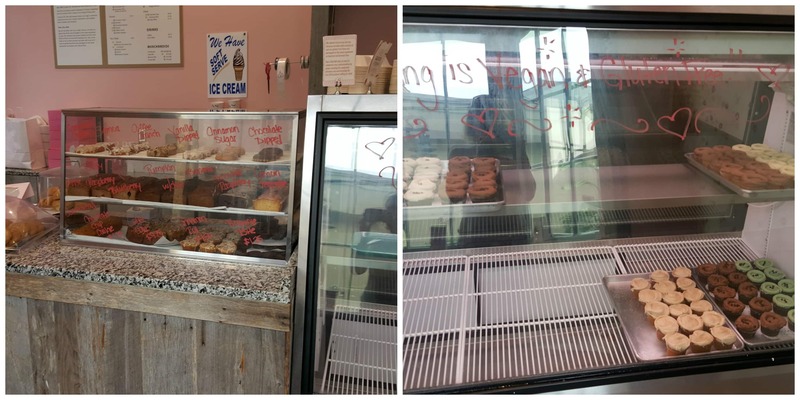 It’s a vegan and gluten free bakery. We got there right as it opened, so they didn’t have everything set out yet. We decided to each get a homemade biscuit with broccoli and vegan cheese. I though it was really good, but Marcus didn’t like it too much. 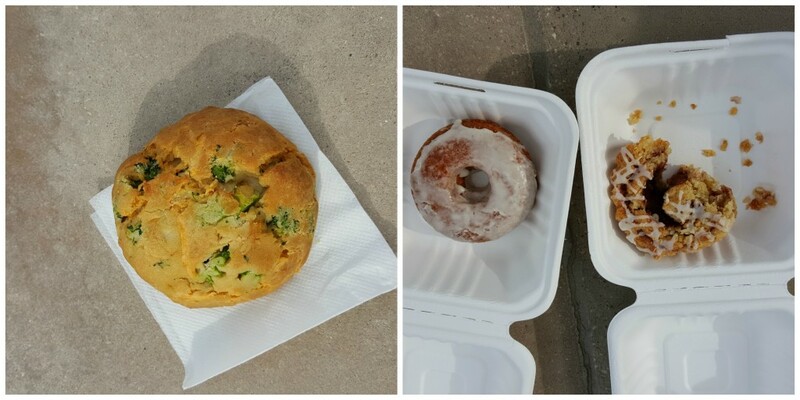 In addition to that, we also got the cinnamon roll and a vanilla donut. Marcus was not a fan of the donut because it had some citrus flavor to it. I LOVED the cinnamon roll. Highly recommend it. I was so excited to take a bite, that I forgot to photograph it first. So that is why the cinnamon roll is half eaten lol. 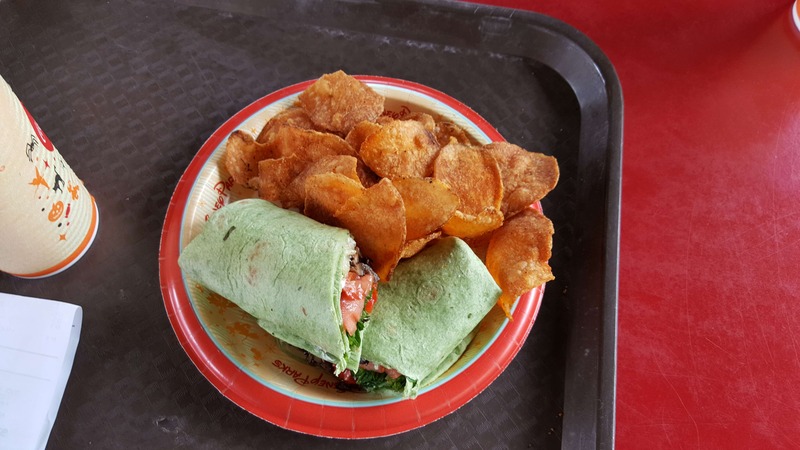 For lunch that day, we were at Hollywood Studios. We wanted to eat light to save our appetites for Boma that evening. So we stopped at Studio Catering Company and split the veggie wrap. To keep it vegan, just omit the cheese and yogurt sauce. It was surprisingly good and plenty big enough to split. They potato chips it came with were made in house. I am not a chip person, so Marcus ate those. That night we ate at Boma in Animal Kingdom. Hands down my favorite meal of the whole trip. It’s a buffet, so they chef came out and walked us through what was vegan. He also made the lentil salad for me without the feta it normally comes with. It was amazing!! I could have eaten more if I had the room! 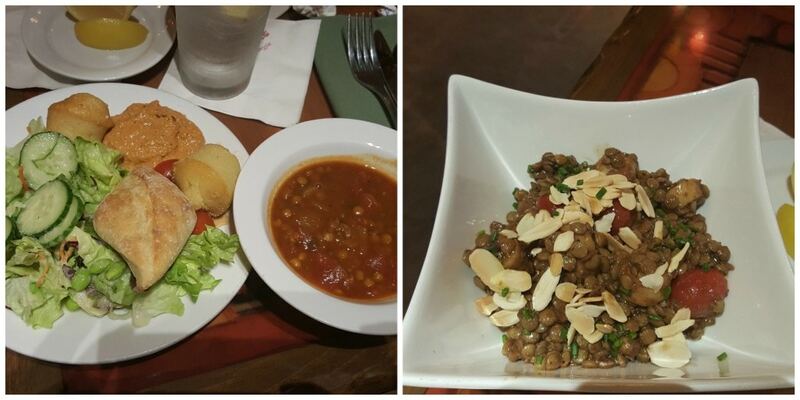 In addition to the lentil salad, I also had African lentil soup and salad with an apple vinaigrette. The bread was all vegan too. He also made a special dessert plate for us that included raspberry sorbet, fruit, Enjoy Life cookies and brownie bites from Erin Mckennas. So good! Later that night, we went back to Disney Springs to get some breakfast for the next day. I got the coffee cake and Marcus got the chocolate raspberry bread. We also got a cupcake to try. 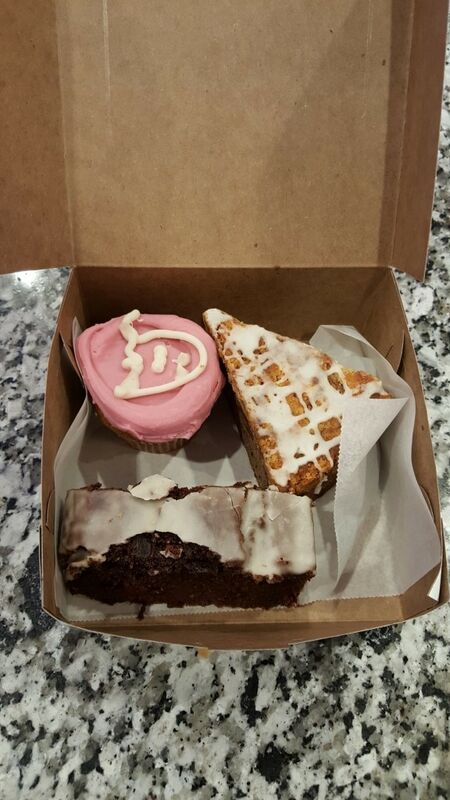 I was not impressed with the cupcake, but I loved the coffee cake and Marcus loved the raspberry bread. We ate these as we waited for Magic Kingdom to open the next morning. Getting there at rope drop is a must if you want to get on Mine Train without a wait. We were unable to score fast passes for it, but we walked on as the park opened. We were also able to ride space mountain like 3 times without a wait. Trust me when I say the wait times at Magic Kingdom are insane as the day goes on. For lunch that day, we ate at Cosmic Rays. It’s a quick service. We both got the veggie burger and fries. 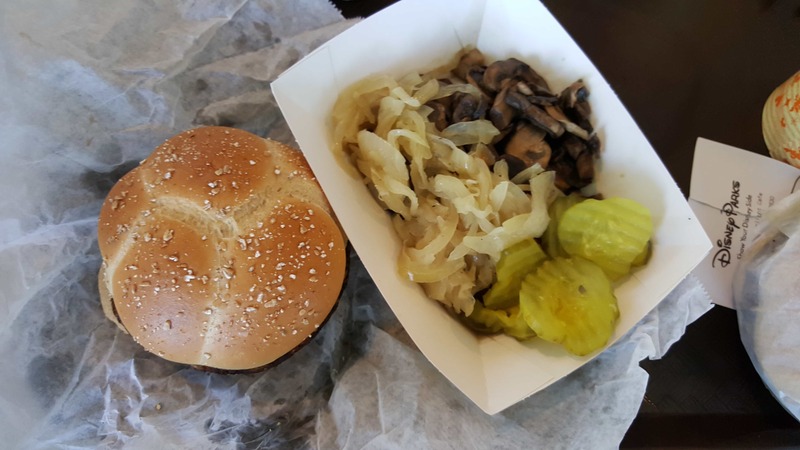 One thing I loved about this place is that they had a fixings bar that included sauteed mushrooms and onions. I loaded up on those and ate them as a side. I only had a couple of fries since I was so full from the veggie burger. That night we ate at Trail’s End at the Wilderness Campground. It’s only a short boat ride away from Magic Kingdom. I had heard about Trail’s End in the Vegan Disney group I am in. They rave about Chef TJ and how he hooks up vegans. Sadly, he was not there that night, but Chef Steven did make me a delicious ratatouille. There was also steamed green beans and carrots plus salad with balsamic vinaigrette. 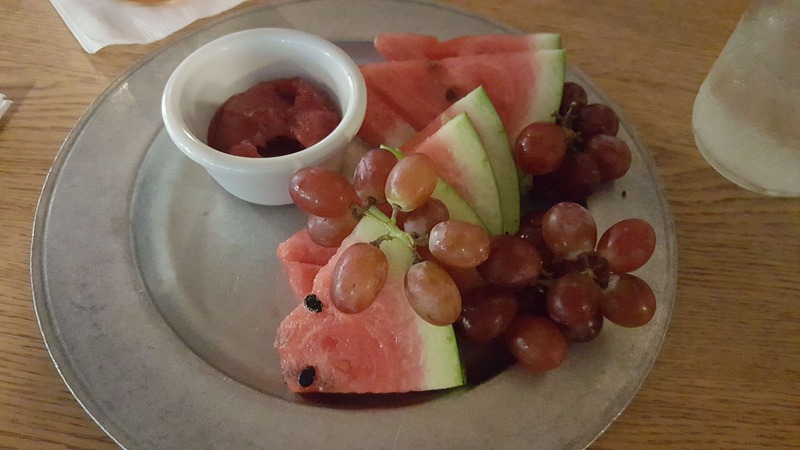 He gave us fruit and sorbet for dessert. If you are walking around the parks and just want a little something, all the popcorn and pretzels are vegan. 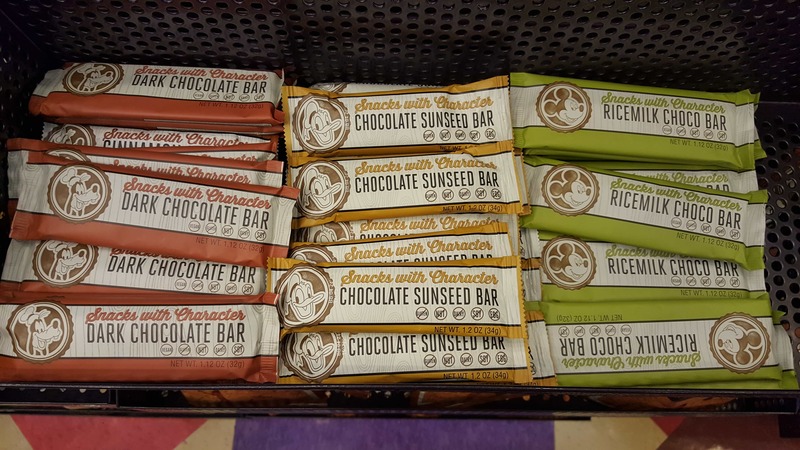 They also have these allergy friendly bars as well as allergy friendly cookies in every shop. You can also find fresh fruit and hummus at some of the food kiosks. The next day we were spending the day at Epcot. We had booked a lunch at Coral Reef in The Seas. I was slightly doubtful that I would find something to enjoy there, but boy was I wrong! The vegan meal option was delicious. I didn’t even had to ask for it special. It was on the regular menu. Pretty cool. The bread they serve was vegan. They just brought out some olive oil to dip it in instead of butter. For an app, I ordered the heirloom beets without the goat cheese. So good! Steamed beets with some candied pecans and greens. The vegan meal was a Gardein chickn breast on top of black rice, steamed veggies and caramelized onions. There was also a sun-dried tomato sauce on the veggies. The whole thing was amazing. Probably my second favorite meal and I am not really a fan of vegan meat substitutes. But this was good!! We didn’t get dessert there since we were planning to attend a dessert party that night at Epcot. I had heard about the dessert party in the vegan Disney group on Facebook. Evidently, there was an allergy convention going on in Orlando the weekend we were there. 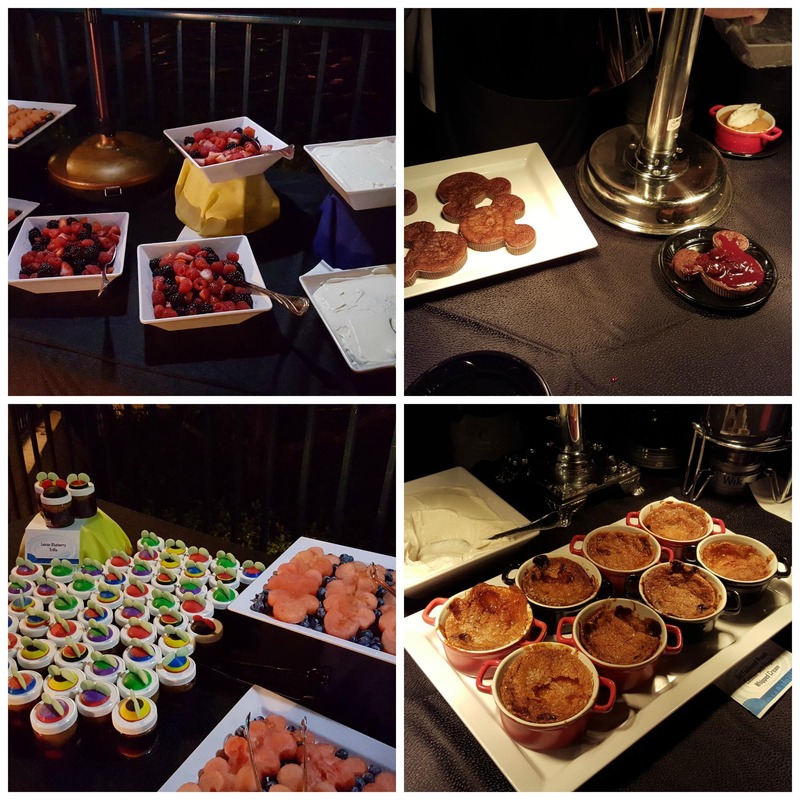 One of the events was a dessert party in Epcot. The ticket was not only for desserts, you also get special seating to watch Illuminations, Epcot’s firework show. 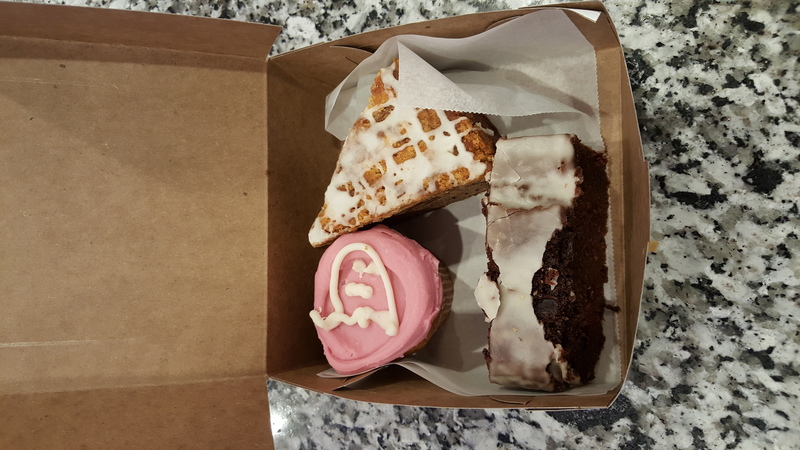 Some of the amazing desserts featured were chocolate brownies with cherry sauce, peach cobbler with vegan whip cream, and a lemon blueberry panna cotta. Everything was delicious, but my fave was the peach cobbler. All the desserts were free of the top 8 allergens. Tree nuts, wheat, egg, soy, milk, peanuts, shellfish and fish. The lighting was not great, since it was outside in the dark. I tried to get the best pics I could though. 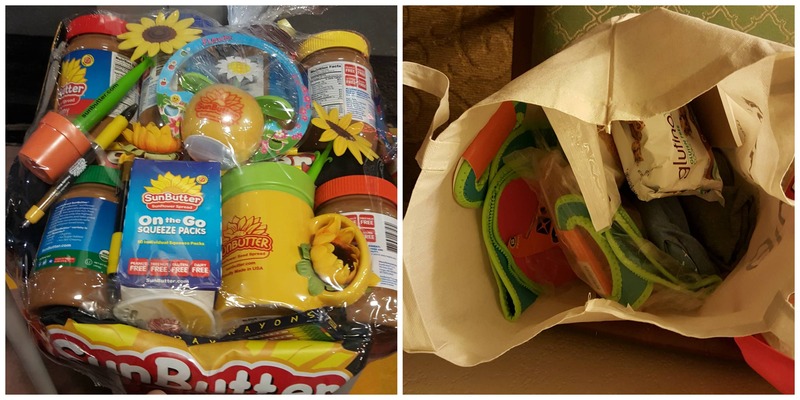 They also had a raffle and I won two prizes! 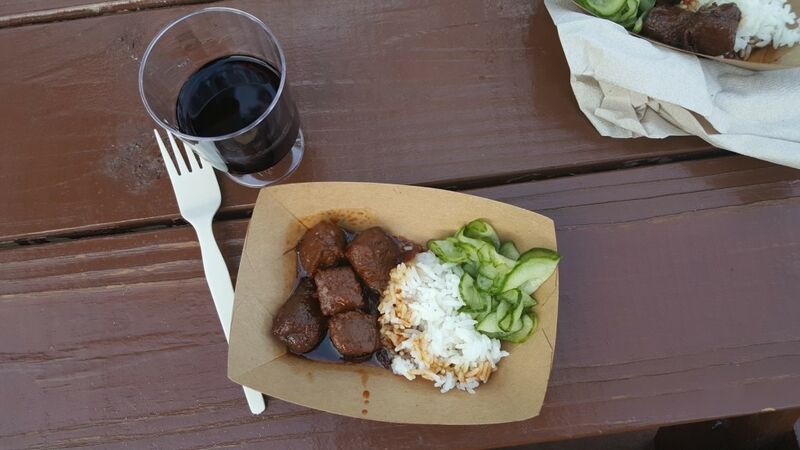 In between Coral Reef and the dessert party, we did get to sample the vegan Korean BBQ at Food and Wine. It came with a raspberry wine. I did hear a lot of people ordering it, so maybe they will have more options next year. The vegan Korean BBQ came with rice and some cucumber kimchi. It was really good, but slightly spicy for me. For the last day of the trip, we started out in Animal Kingdom. Expedition Everest was my most favorite ride. The best part about it is that they have a single rider lane, so even if you don’t have a fast pass, you won’t have to wait too long. I rode it multiple times in a row. Animal Kingdom is probably the most vegan friendly park. Most of the kiosks had lots of options. 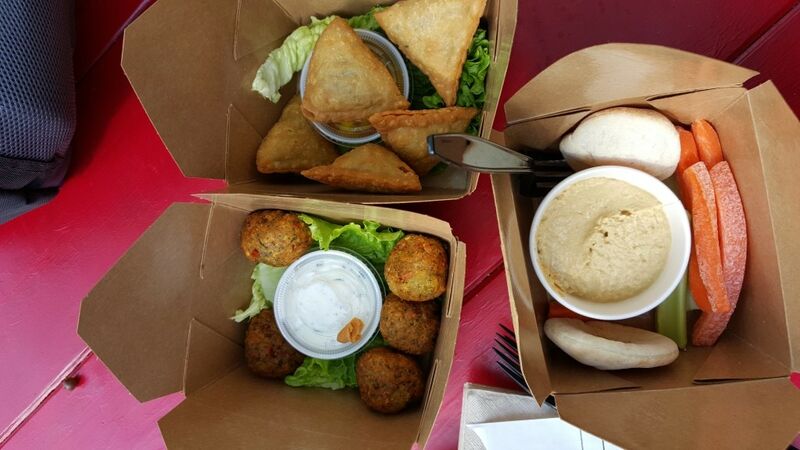 We stopped at one and got the samosas, falafel and hummus. The falafel does come with a yogurt sauce, but we didn’t eat it. We had dinner plans at The Wave that night. It is located in The Contemporary Resort. We had eaten there last year and liked it so much, we went back. They specialize in local food. They even had local and organic beer on top. Very cool! 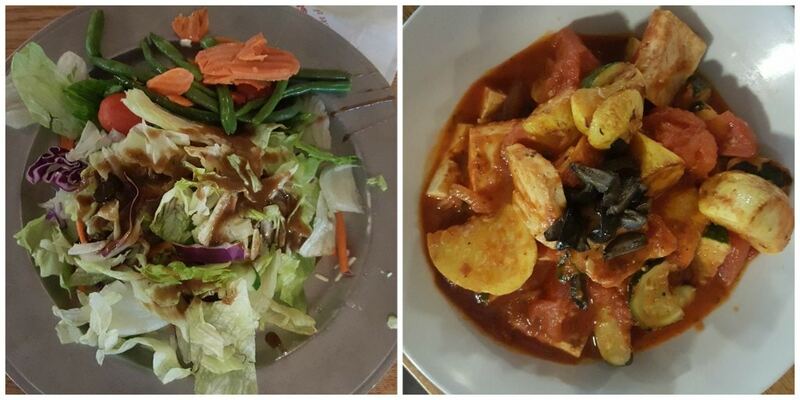 They also have a vegetarian menu that can be tweaked to be vegan. The house made flax seed bread was vegan and really delicious. I got the veggie burger with some sauteed mushrooms and onions. Plus some steamed asparagus. Everything was awesome! For dessert, they had Toffuti Ice Cream. I got that and I happened to have an almond butter packet in my bag, so I added that to the ice cream. It was awesome. Great post with such good info! My boyfriend and I are planning on going to Disney World in the future, how many days would recommend for first timers? Thank you!! It's hard to do everything the first time you go. I think at least 5 days is a good number. You will have a blast! Can you share the information for the vegan Disney group? 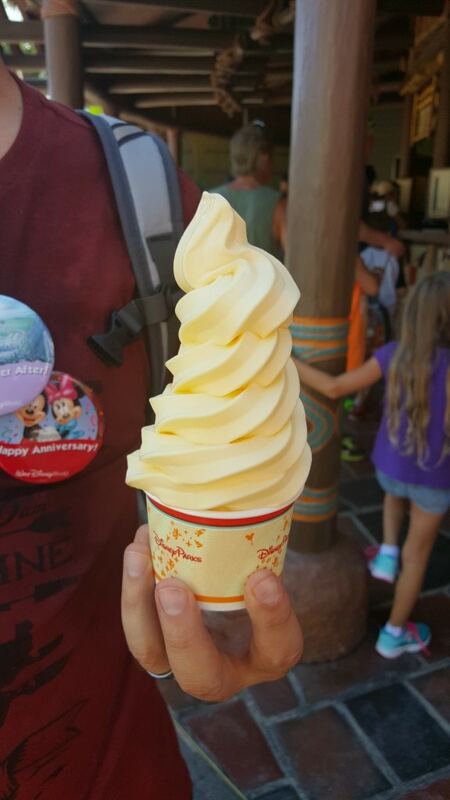 I need Dole Whip in my life! Also, I'd love it if more places in my fairly large city had food like this. I wish that too! It's slim pickins here in Dallas. 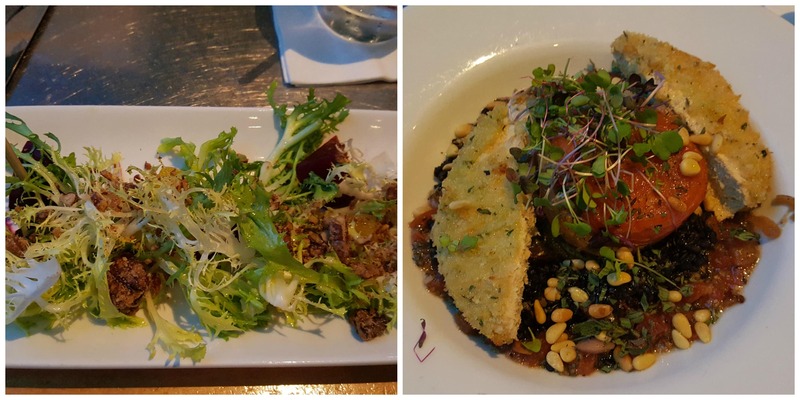 Thanks for sharing your trip with us, the food looked amazing! 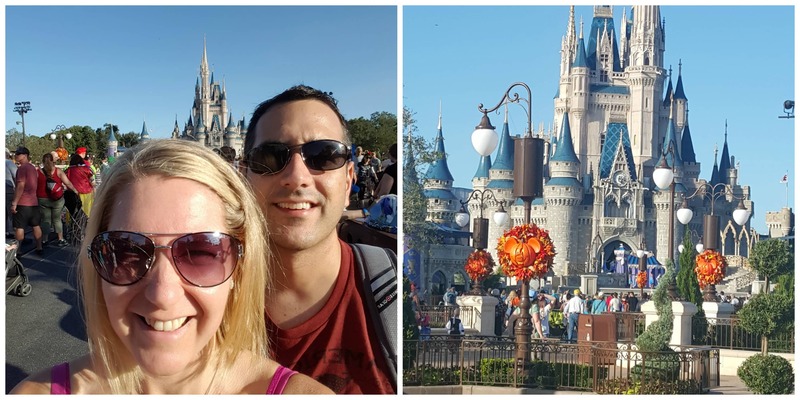 One of the perks of living in Central FL is the MANY trips to Disney. 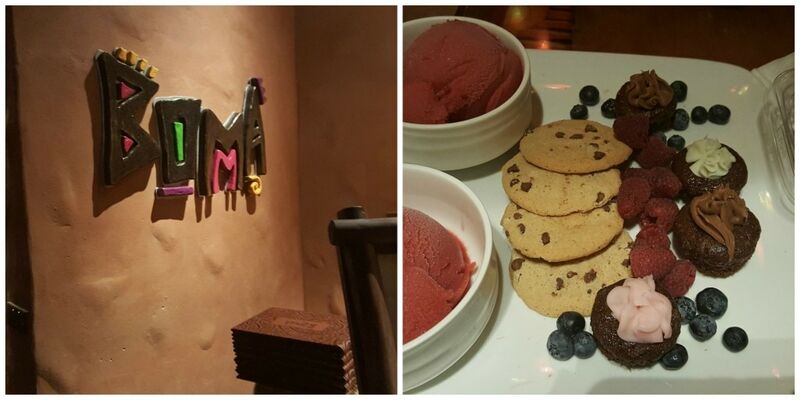 Boma is our favorite restaurant for special occasions. It is a restaurant everyone should experience. So glad you had a great time! Melissa, Lots of good tips! Had to share a couple of things. Disney Springs has Blaze Pizza that we just discovered. It's like a Subway for pizza and you can get all of the toppings you want on a personal for $9 something or other. If you talk with a manager, you can make sure they take sauce from the back that no cheese has dropped into (and the other veggies and pineapple, etc can come from fresh containers. And they have vegan cheese. Make sure you also mention to please cut with another cutter. BUT... these were SO good! And really a great price for all the veggies we got! We also like the avocado guac tacos at Chuy's. AND, unfortunately, because they aren't really "healthy" our guilty treats are the incredible donuts at Valhalla bakery in Orlando. Much better then the bakery in Disney Springs.